Why can't I delete Internet Explorer History? Getting Cleanup is even better than just manually deleting your history. It freed up over 2GB on my harddrive! To find out if you are administrator on your pc, goto control panel and then users and passwords, click on your logon name, and click the properties, see if you are an administartor or not. If you are indeed an admin then there is a problem, if you aren't then someone has disabled it, you mentioned a library do you work there?? or do you just use the pc there?? It really does sound like that someone has restricted you enablement to delete your history, they maybe monitoring people or something like that. I would ask at the library to see. I did download the cleanup...it made the toilet flushing sound. It freed 611 OMB. It would be easy to uninstall it. the temporary files, my problem is how to clear the daily History? (Like I have been saying, it always worked through TOOLS before. When I click on control H, the History is STILL THERE. with this new clean up download. I would be satisfied if History no longer showed. Editing to say that I did go to the control panel and users and I am the administrator. Edited by fflowergirl, 17 July 2005 - 03:34 PM. I would suggest posting up a HJT log in the malware forum, and having them have a look, spyware/malware etc.... can do funny things to your pc. I have been looking on-line about this, and have found that AOL instant messanger stop this, have you got this?? or has pcpeople?? are these your ISP?? have they got an instant messanger?? if so this might be stopping it. 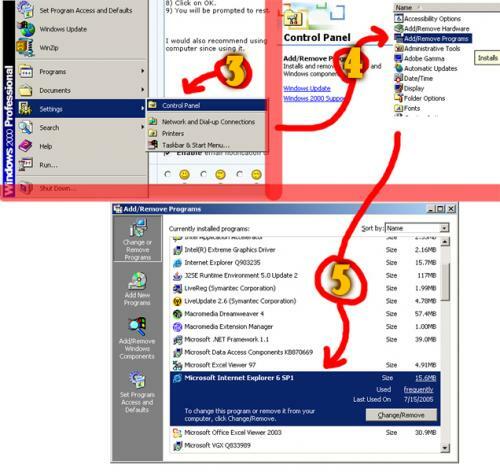 If you do have either of these running, click on the icon bottom right corner and click exit, then stop it from auto running on start up, using the msconfig thru run, or get winpatrol, excellent proggie that lists all your start up progs, and allows to config it all. This should allow you to do this again. Have you installed any new progs? ?, post back and let us know, but posting the HJT log could be a big help for you. edit due to new info. Edited by woody1977, 17 July 2005 - 04:58 PM. Could anyone tell me HOW to do this? This may be a registry problem. Have you ever edited the registry before? No, I never have edited the registry before. Anyway, as far as I know I haven't. I changed something without realizing it???? to do and I do not have a clue how to do this or even if I should. Edited by fflowergirl, 17 July 2005 - 09:01 PM. Typed urls are not History files. Once the Registry editor window opens, navigate the registry by clicking on the plus signs. Check to see if the above keys exist. Please do not delete any keys while in the registry, or your machine may be damaged. out why I CANNOT delete History from my Internet Explorer browser. Could I type the above in somewhere? I did get this reply from my Internet Provider since writing the above note. Thank you for writing to PeoplePC Online. 3) Click on Control Panel. 4) Double click on Add/Remove Program. 5) Under Install/Uninstall tab, click on Microsoft Internet Explorer. 6) Click on Add/Remove button. 7) Click on Repair Internet Explorer. 9) You will be prompted to restart your computer. If the problem still persists, please send us the exact error message that you are getting. Once we get the details, we will be more than happy to assist you. The problem is, when I go do Control Panel, I DO NOT SEE INTERNET EXPLORER. Is it HIDDEN under some other Microsoft term?...I know I have it or I would not be able to be connected right now. I would even be happy to not even have History. At the library, they have it so no one can check History. Check my attachment for a visual. I would also recommend using firefox. I've had approx 10x less problems with my computer since using it. Brad/Stacy....I thank you so much for trying to help me. I wish you were sitting right here at my computer because you could probably FIX IT. 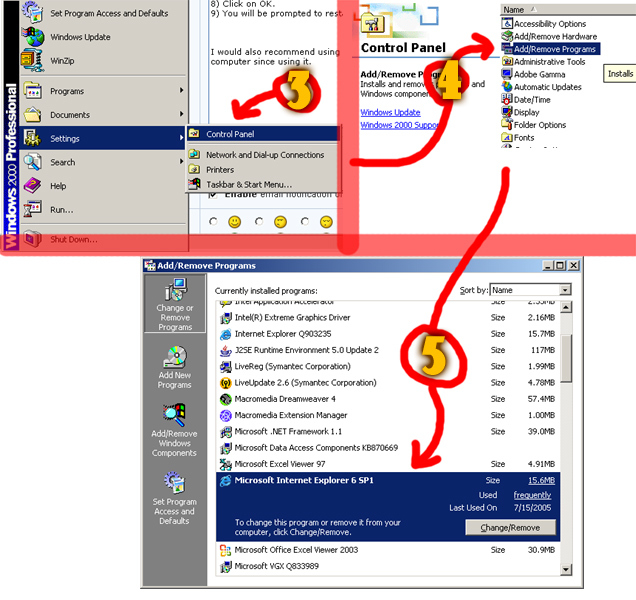 When I go to control panel, I tried double clicking on add/remove programs and still do not see Internet Explorer in any of the programs. "The proxy server you have configured could not be found. Please check your proxy settings and try again." I DO NOT KNOW HOW TO DO THAT...I have tried to find the answer by typing the question in yahoo search but haven't figured it out yet. Could you tell me in simple terms...I am a bit of a novice here. These are called registry hives. You expand them by clicking on their respective plus signs (+). The registry entries I gave you are like home addresses... they tell you where in the registry they are located. To get to this first one... click on the plus sign of Hkey_Local_Machine, then click on the plus sign of Software, then on the plus sign of Policies... and so on until you get to where you're trying to go. Is that a little clearer? REMEMBER, all we want to know is if the entries are there, they might not even be there, and even if they are, this whole registry thing might not even fix your problem... but it's worth the check. Here are the keys again... DO NOT EDIT THEM if present. Are you using Mozilla or Firefox. Either way, launch the browser and go to Tools, then select Options. Select General and look for Connection settings. Click on that and choose Auto-detect proxy settings for this network... or Direct connection to the Internet. Try each one if needed. Close the browser and relaunch it. Then see if you can connect. If you are using a firewall, you may have to grant Mozilla/Firefox access as it too may be stopping you from connecting. Dear Makai...I tryed expanding the HKEY but did not come up with any long 'addresses' like the two you gave...only one word after each plus click. I have never done this before so don't really have a clue what I am doing! I did go to Tools...Options....General...Connection Settings and then to click on 'Direct connection to the Internet' and now Mozilla Foxfire connects fine. What I DON'T like about Foxfire, I will write in a seperate topic. Ok, Sorry I couldn't be of more help. There are a ton of things that can cause your problem with the History functions in IE. I really have not encountered them before. In any case, good luck finding the fix... I know there is one! As for Firefox, I use it exclusively. If you have any questions, I will certainly post replies in your new thread. My prediction... you will soon no longer use IE!